by Craig Zabransky on January 27, 2015 in Where to Stay? Yucatán’s capital city, Mérida, leaves an impression on its visitors. The grand paseos, tasty local cuisine and a place enriched by its hacienda history continues to grow in popularity for visitors seeking to travel inside Mexico and explore beyond its beaches. 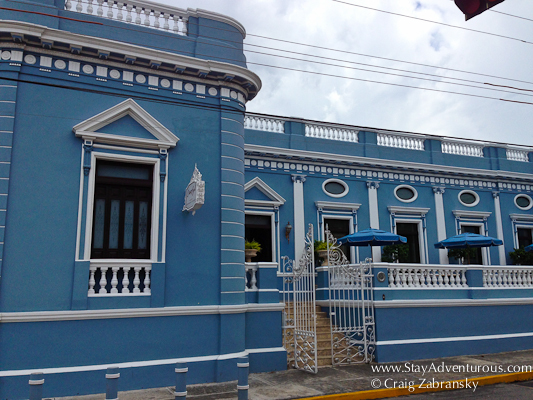 And when searching for a place to stay in the heart of Mérida, a city nicknamed the white city, you need to think of a different color, you need to think blue – Casa Azul Hotel (Blue House Hotel). 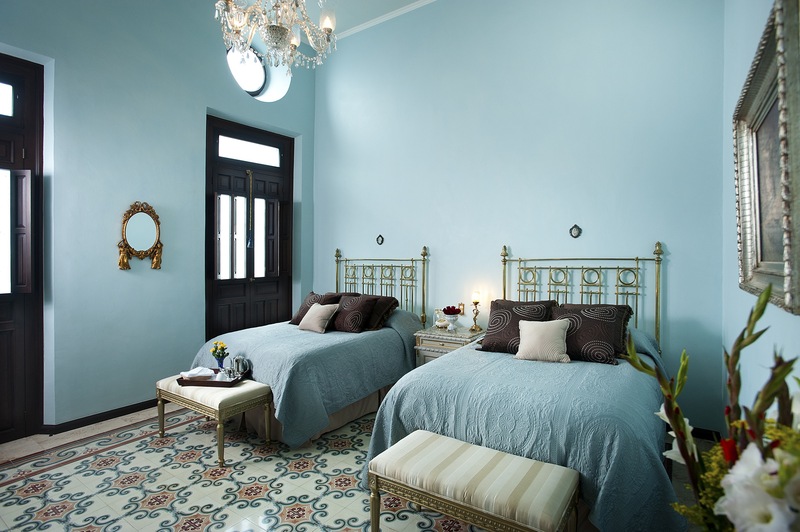 I discovered Casa Azul Hotel, part of the Premium Yucatan experience, during my recent visit to the state of Yucatán. 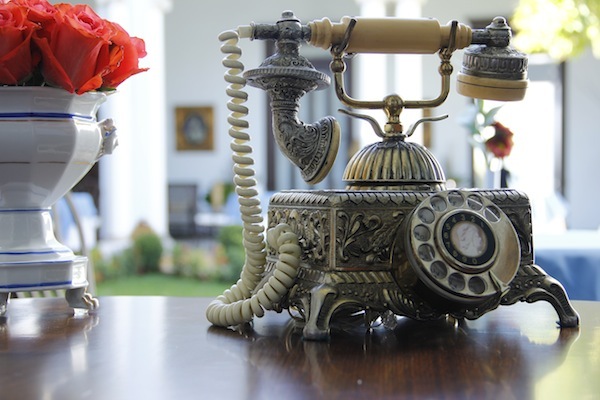 The small boutique hotel, once a local French manor in the city’s historic heyday (now a historical landmark), keeps history alive with its french elegance and decor along with its preserved original architecture, design and artifacts. 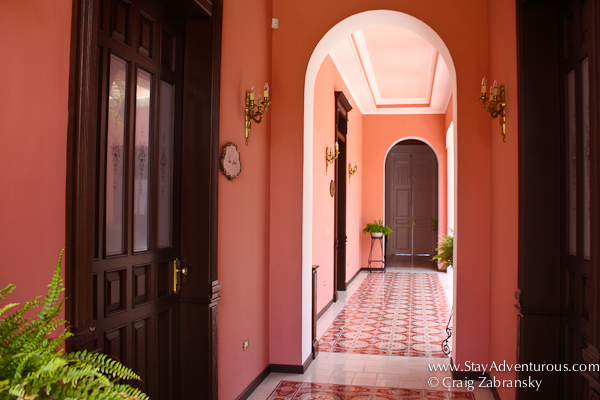 The boutique hotel is situated as a perfect place to enable first time visitors to ease into exploring the city of Mérida. I found myself centrally located and essentially treated as if I was the owner of the original french manor. Just a block from the famous Paseo Montejo and a few blocks from the main plaza or Merida’s Zocalo, the location is prime for just walking the city. Although I arrived with a car, I never drove around the city except when arriving and departing. Plus, if the weather was uncooperative, either too hot or even rainy (Casa Azul provides umbrellas during your stay), taxi service is extremely safe and reasonable. I don’t often equate city hotels with a pool, but this is Mexico and it can be hot, very hot. So taking an afternoon dip became the perfect way to refresh before evening plans. Plus, the practically private pool became a perfect way to take in some sun, enjoy a cocktail, and experience the famous post lunch afternoon siesta. After my stay in Casa Azul Hotel, I am starting to ponder if the white city nickname actually comes from its service, white glove service not its buildings. At the Casa Azul annex property (it has two locations) across the road, there was access to a 24 hour butler, who always opened the door with a pleasant greeting and delivered everything I needed from my afternoon siesta cocktails to both complete breakfasts (included) and one evening’s delicious dinner. At one point, I was asked, what I thought of the impressive original door to the building, but I realized I never touched it – it was always opened for me. The property only rents its rooms to adults with one exception -renting the entire annex across the street. 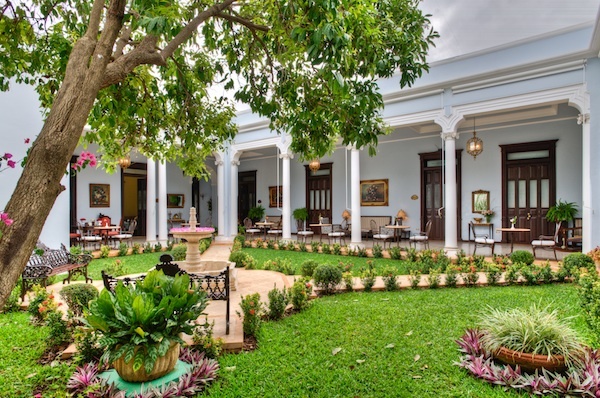 With its closeness of the rooms connected through tranquil open aired courtyard, the boutique hotel attracts clients who both want to appreciate Mérida but also experience the grandeur, service and style of Casa Azul itself. Understandable. 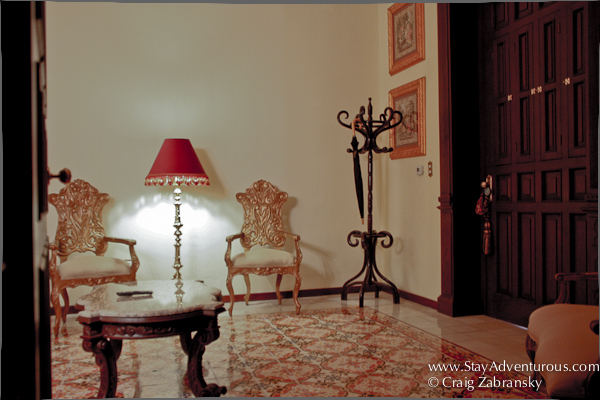 However, entire families can reserve the entire building (3 rooms including the Presidential Suite). It is certainly worth an inquiry, and staying inside the presidential suite myself (and having the entire annex) I can certainly recommend that option. To experience and live the history of the city of Mérida, the white city, think blue. Casa Azul Hotel seemed to be the perfect place for an extended weekend getaway or as part of a a longer journey through the intriguing state of Yucatan. It is a place to relax and unwind and still offers much of the city Mérida close. The staff just doesn’t provide service, but can also recommend what to see and do in the area, which there is plenty. Currently, you can reserve a a room in mid February for $300 USD per night (breakfast included). 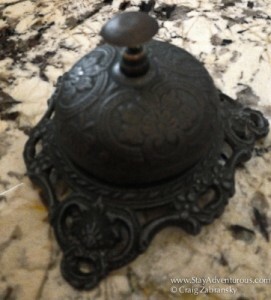 I was a guest of Casa Azul Hotel, but in no way does it affect my opinions and story. Also, as part of my experience, I discovered the state of Yucatan is much more than Chichen Itza thanks to my travels to Premium Yucatan properties. 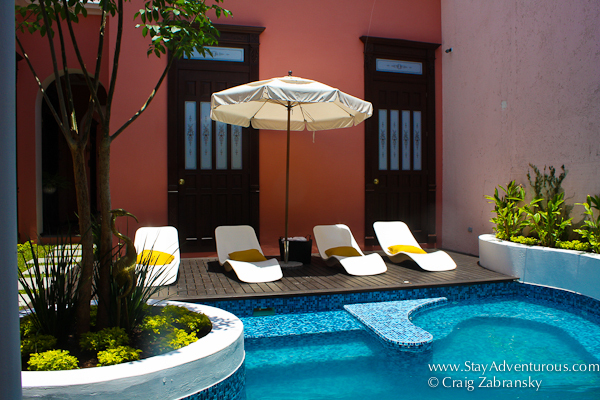 Also all photographs not marked with @StayAdventurous are courtesy of Casa Azul Hotel. That abode looks wonderful Craig and I do love the city. It is a great place for a pamper. But as a solo traveler I stay on the park bench near the Cathedral. Be Well Craig. With a pool to cool off in after a hot day touring the city, I would not be blue staying here. That’s a great looking pool. I like the idea of a siesta cocktail. I don’t take enough time to just relax and this looks like a good place to sit back and relax, with drink in hand, of course.